The dosimetry of electron beams from four different linear accelerators (Varian Clinac 1800, Siemens Mevatron MD, Mitsubishi EXL-14 and Mitsubishi EXL-17 DP) was studied as a function of beam energy, applicator size, and cutout size. The cutout factors (COF) were calculated as the ratio of the blocked field to open field ionizations at the surface, the reference depth (dmax) and an intermediate depth. Polystyrene phantom material was used as the scattering medium and the two electron energies (6 and 12 MeV) common to all accelerators were selected. From these studies, it is apparent that a COF greater than unity is possible when the blocking is approximately more than 50%. The COF was found to be different for different accelerators and generally, the variation was more pronounced for the 12 MeV compared with the 6 MeV electron beam. For the small diameter cutouts, the COF decreases with increasing depth of measurement. The surface dose showed about 6% increase for the 12 MeV and about 3% increase for the 6 MeV beams in the Siemens unit. These measurements implicate that the COF is significantly affected by the accelerator and applicator design, angular distribution of the electron beam, and the air gap between the applicator and skin surface. The air kerma measurements for brachytherapy sources are generally recommended to be done at one meter using large volume chambers. These measurements pose problems due to low signal from brachytherapy sources. Non-availability of calibrated large volume chambers at a hospital adds to the problem of air kerma measurements. Therefore, the use of commonly available secondary standard dosimeter having 0.6 cc chamber has been examined. Correction factors to be applied at small source to chamber distances have been determined. Measurements from Cs-137 source of nominal activity as low as 1 .11 GBq (30 mCi) could be carried ' out using an integration time of about 20 minutes at minimum distance of 1.5 cm. For source to chamber distance beyond 5 cm, the correction factor approaches unity. 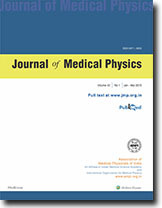 The applications of Electron Paramagnetic Resonance (EPR) for radiation dosimetry are briefly reviewed. In particular, EPR-alanine dosimetry and accidental dosimetry using EPR signals from human tooth enamel have been discussed. The alanine dosimetry was found to be useful from low doses such as 1 Gy to high doses such as 100 kGy. The signals from tooth enamel are found to be invaluable in assessing the absorbed dose of people exposed to radiation accidents and also survivors of atomic bomb explosions. New emerging trends using EPR signals from bones exposed to radiation have also been briefly reviewed. The effect of misonidazole (MLSO, 500 mg / kg b.wt. ), hyperthermia (HT. 42'C for 30 min) and their combination with or without irradiation (1 .O, 3.0 or 5.0 Gy of gamma rays) was studied on the bone marrow toxicity by the spleen colony (CFU-S) assay. MISO or HT alone did not have any effect, while whole body irradiation produced a significant reduction in the number of CFU-S compared to sham-treated mice. Combination of MIS0 with radiation did not show any significant reduction in the number of CFU-S from that of the irradiated controls. However, post-irradiation HT decreased CFU-S count significantly from the radiation alone treated group. The combination of all the three agents, MISO+ radiation+ HT, produced a further decrease in the stem cell survival from irradiated controls; this effect was sub-additive. Thus, our results indicate that though MISO itself may not have any noticeable radiosensitizing effect on mouse bone marrow stem cells, a sequential administration of MISO, radiation and HT, can enhance the radiation-induced stem cell mortality. As measurements of dose rate and other dosimetric functions in water are recommended instead of dose rate calculated from air measurements and published data, a low cost water phantom was designed and manufactured to favour all such measurements. This paper discusses the design and further possible improvements of the same.